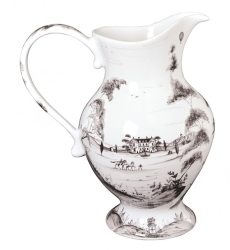 This stately show-stopper conveys the virtues of home and hospitality. Use it to proudly display your culinary adventures, from the casual Friday night chicken for two, to your famous Christmas roast for ten. Featuring: Main House, Stable, Boathouse, and Hot Air Balloon . 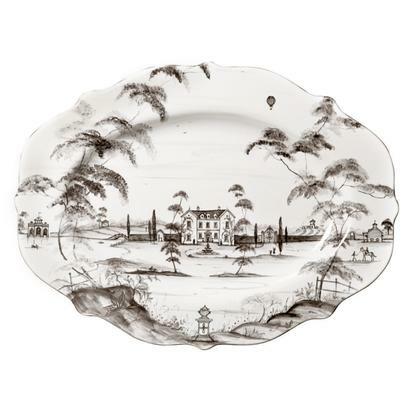 Dimensions: 18.5 in L x 13.5 in W.
May the bounty of your table be as boundless as the lovely English landscapes depicted in Juliska's new dinnerware collection, Country Estate. With every nibble or sip, you take one step further on a charming narrative of English country life, with a different enchanting scene on each piece illustrating its romantic architecture, bustling activities, and grand vistas. By interlacing age-old decorative techniques with a chic, neutral, palette and unrivaled functionality, Country Estate mainta ins thoroughly modern sensibilities while still feeling from the manor born. Mix it effortlessly with many of Juliska's other collections, most notably the Berry and Thread designs and cool Pewter Stoneware. This graceful collection is the result of an elegant duet between The Juliska designers and Deborah Sears, renowned designer and painter of Isis Ceramics in England.